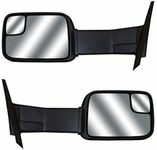 We carry turn signal, OE style replacements and universal side view mirrors plus replacement mirror heads and accessories from brands like CIPA, Muth and Rally. Be sure to browse through our wide selection of automotive mirrors including rear view, side view, OE replacement, towing and convex safety mirrors. Universal mounting fits most vehicles on both left and right sides, swing away arm design, extends to 12"